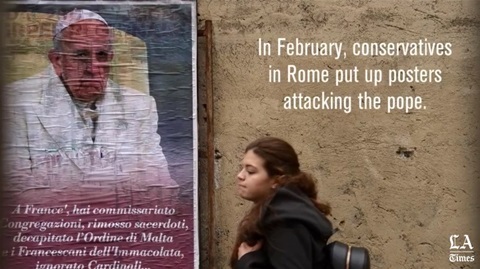 Of all the recent attacks launched by conservatives against Pope Francis, one stood out more than most. It came from a German cardinal who is one of the most powerful men in the Vatican. And it underlined a growing backlash in the church to some of Francis’ more progressive ideas — a backlash led largely by German and American bishops who fear the pope may be overturning centuries of doctrine on divorce, among other matters. The cardinal, Gerhard Mueller, the pope’s own doctrinal chief, made it clear in an interview in February that he firmly opposed Francis’ tinkering with the church’s ban on divorced and civilly remarried Catholics taking Communion. As Francis enters his fourth year in office, his conservative opponents have chosen to stand and fight over his 2016 apostolic exhortation titled “Amoris Laetitia,” or “The Joy of Love,” in which he suggested bishops can use discretion in granting Communion to Catholics who divorce, then remarry in a civil ceremony. Francis’ guidance was seen by many as contradicting the ruling, which dates to the early days of the Roman Catholic Church, that couples are living in sin if they remarry, because their first marriage is still valid in the eyes of the church. Francis’ opening was part of his mercy-before-doctrine drive, which welcomes outcasts to the church rather than use dogma to keep people out. But for conservative Catholics, it was another reason to feel aggrieved, after Francis appeared to suggest in 2015 that Lutherans could receive Catholic Communion, and, when asked about gay people in 2013, said, "Who am I to judge?" It was enough to start talk of a schism in the church. 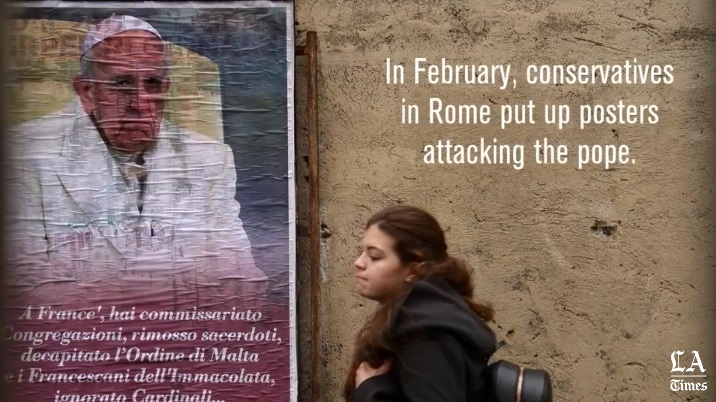 In February, anonymous conservatives in Rome responded by putting up posters attacking the pope, while rumors spread of prelates plotting to make him resign. Mueller’s senior role as the the head of the Vatican’s Congregation for the Doctrine of the Faith gave his criticism extra weight. But his nationality also provides a key to understanding the roots of the row — one that has been raging for years and started not in the Vatican, but in Germany, long before Francis was pope. “With ‘Amoris Laetitia,’ Pope Francis simply took sides in a battle which German bishops have been fighting for years,” said Julius Mueller-Meiningen, a Vatican expert who covers the Holy See for Christ & Welt, the religious supplement of the German weekly Die Zeit. The battle got underway in 1993 when three German bishops — Walter Kasper, Karl Lehmann and Oskar Saier — had a letter read out in all the churches of their dioceses stating it was time to talk about the rule on people who remarry after divorcing. Arguing that there should be wiggle room “in complex, individual cases,” they used the kind of language Francis would employ almost a quarter of a century later. Back then, there was another conservative German heading the Congregation for the Doctrine of the Faith — Cardinal Joseph Ratzinger, later to become Pope Benedict XVI. He shot back with a strongly worded letter to his fellow Germans, telling them to stick to the rules. “If the divorced are remarried civilly, they find themselves in a situation that objectively contravenes God’s law,” he wrote. Kasper and Lehmann continued the debate in an informal group of prelates, nicknamed the St. Gallen group after the village in Switzerland where they met. Among their discussions: Who would be the next pope? Mueller-Meiningen said he was told that, before the 2005 conclave to elect the successor to Pope John Paul II, the cardinals talked about Cardinal Jorge Bergoglio of Buenos Aires as a possibility. But the group’s plans to elect a reformer like Bergoglio were thwarted when Ratzinger was picked instead. “After the election of Ratzinger, the group met for the last time in January 2006, then broke up,” said Mueller-Meiningen. But then Benedict unexpectedly resigned in 2013. He cited health reasons, though rumors swirled at the time that he was also worn down by bitter power struggles behind the scenes at the Vatican. In any event, with his departure, the German cardinals “had a second chance,” Mueller-Meiningen said. Again the group supported the candidacy of Bergoglio, and this time their man won. Cardinal Bergoglio became Pope Francis. A year after his election, Francis invited Kasper to address a consistory of cardinals, where the German prelate re-pitched his ideas about granting Communion to people who divorce and remarry. Conservative cardinals were quick to react. Five of them published a book-length explanation in 2014 about why the Communion ban could not be lifted. Among them were American Cardinal Raymond Burke and two Germans, Mueller and Walter Brandmueller. Undeterred, Francis held two synods in 2014 and 2015 that discussed the issue. “The German-language discussion group at the second synod, including Mueller and Kasper, had the most eloquent debating,” said Andrea Tornielli, a Vatican expert at the website Vatican Insider. George Pell, a conservative Australian cardinal, told France’s Le Figaro newspaper that the synod debate was just the latest episode in a long-running theological battle between Kasper and Ratzinger/Benedict. Translation: In some cases, a sinner — say, someone who was divorced and remarried — can receive Communion, the central sacrament of Catholicism. This time, four cardinals, including Burke and two Germans, Brandmueller and Joachim Meisner, wrote to Francis in September asking whether “Amoris Laetitia” broke with existing doctrine. When they received no response, they went public with the letter in November. Conservatives chimed in to lend support. Archbishop Charles Chaput of Philadelphia said last month that he wanted Francis to answer the questions posed in the letter. “How can it be true that people can receive Communion when they’re living in an adulterous union today? How is that possible, when the church says it’s not possible?” he asked the independent Catholic website Crux. Crux editor John Allen said American Catholics were divided, with some bishops — such as Chaput — insisting that the doctrine was unchanged, while others, including the archbishops of Chicago and Washington, saying Communion for divorced Catholics can be acceptable in some circumstances. On the same day, Mueller’s interview appeared in Il Timone, showing yet again how the country where the debate started remains split on the question.